Prepare: Clean and peel fresh shrimps. Wash mushrooms and dip them in lite salt water. Heat the oil and add purple onion, then put shrimps, mushrooms to the pan and stir. Season with fish sauce, salt, sugar, then pour 200ml boiled water to cook. When they‘re ripe, mix one tbsp flour (cornstarch) into there. When the sauce becomes slippery, add chili sauce and mix well and turn off the oven. 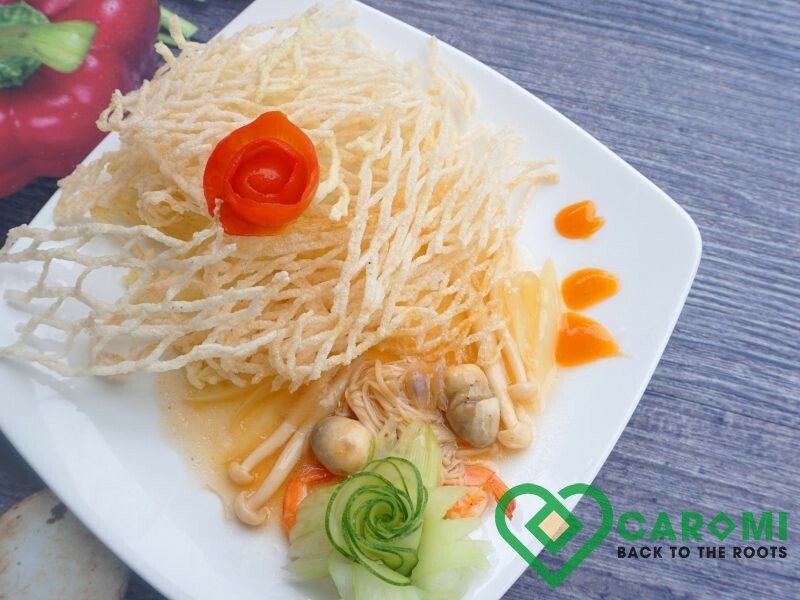 Break cassava noodles in small pieces. Wait the oil boiling, then put those pieces in the pan and fry shortly. Take them out to drain oil. Deliver fried cassava chips on the plate, sprinkle the sauce over, decorate with a little cilantro and server.